Saracens ran a six-try riot as they reached the final of the ongoing season of Aviva Premiership with a 57-33 win over Wasps in the play-off at Allianz Park on Saturday. As a result, Saracens will face Exeter Chiefs in the final of the tournament at Twickenham Stadium on 26th May. It took Saracens less than two minutes to score their first points on the board when Danny Cipriani knocked on and Owen Farrell was quick to offload Alex Lozowski, who went past the line. Farrell slotted the conversion to make it 7-0 and the lead soon doubled when Vincent Koch went past the line in the 11th minute. Farrell, who kicked the extras also followed with three more penalty goals as Sarries scored 23 points in the first half. Wasps' only response in the first half came when fullback Willie le Roux touched down in the 23rd minute but they suffered a setback when Jack Willis, who received his first England call-up last week due to a knee injury that could keep him out of the upcoming South Africa tour. Saracens extended their momentum in the second half when Chris Wyles in his last appearance for the Allianz Park outfit dotted down and Farrell slotted down. Wasps responded back when Elliot Daly's effort was disallowed controversially but back to back tries from Jake Cooper-Woolley (47') and Thomas Young (50') and Jimmy Gopperth kicked the conversions on both the occasions to bring the scoreline to 30-19. 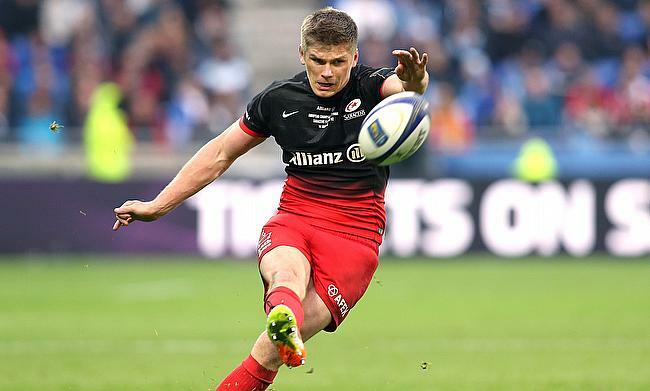 Farrell kicked two more penalties to stretch Saracens' advantage but le Roux with his second ensured the gap was down to 10 points at the end of the third quarter. But, the game was over for Dai Young's men when Juan Figallo and Maro Itoje added further tries in the 64th and 71st minutes respectively. Wasps managed to score again when Guy Thompson sent Christian Wade over the line but Ben Spencer with his 76th-minute touchdown capped off a fantastic game for Saracens as they completed a 57-33 victory.